The supporters of the Iranian opposition movement gathered in Paris expressed their determination by chanting together “we will fight. We will die. We will take back Iran”. With the opposition movement gathering momentum each day, and international governments turning against their policies of appeasement towards the mullahs, there is no doubt that the supporters are right. They will take back Iran. The mullahs have few options left. Maryam Rajavi told the audience at the Free Iran rally, “the blood of the martyrs has permanently blocked the path of reform”. The People’s Mujahedin Organisation of Iran (MEK) has contributed more than 120,000 of its members in the struggle to free Iran from the tyranny of the mullahs. More than 30,000 of its ranks were executed in a single summer of 1988. As Maryam Rajavi pointed out, no one can rival the MEK “when it comes to honesty, sacrifice, and paying the price”. When the inevitable occurs, and the clerical regime falls, it will be the MEK and the National Council of Resistance of Iran (NCRI), that will be ready to usher in Iran’s new era of democracy. Maryam Rajavi pointed out that with the regime gone, the first step in Iran will be to transfer the sovereignty to the Iranian people. A provisional six-month government will be formed to prevent a descent into chaos. This provisional government will carry out free and fair elections with a secret ballot to form a constituent assembly. The constituent assembly will then have two years to draft a constitution for the new Iranian republic and put it to a public vote. Based on the people’s vote, the assembly will set up new institutions. This new democratic government will be able to eradicate high prices, water shortages, environmental damage, and poor living conditions. It will be formed on the values of democracy, national autonomy, freedom of expression, freedom of attire, freedom of the media, the separation of religion and state, the rule of law, peaceful coexistence, and international cooperation. The NCRI’s plan for the autonomy of Kurdistan is one of the most comprehensive global examples addressing the rights of nationalities. Maryam Rajavi used her speech to call on the support of the Iranian people in realising this dream of creating a democratic Iran. She called on Iranians to give their support to the opposition movement wherever they are. 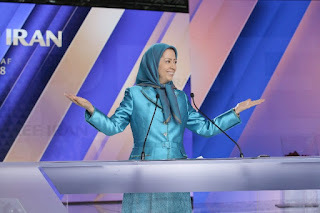 Finally, she ended her speech with a tribute to those who had already made the ultimate sacrifice and given their lives to the freedom of Iran. She paid tribute to all the martyrs and resistant prisoners from 1981 to today, laying flowers to commemorate the martyrs of the 1988 massacre to mark the 30thanniversary.